Ah, tis May, tis May.. the Merry Month of MAY! This Month’s Travel Contest comes from the Good Folks of Grand Millennium Kuala Lumpur! Grand Millennium Kuala Lumpur is a superb, 5 star hotel that’s conveniently located right in the hub of activity, KL’s Golden Triangle – Bukit Bintang, home to prominent shopping, entertainment centres and one of the busiest streets in KL. The hotel is great for both business and leisure travelers. The comfortable 468 rooms exude a familiar feeling of homely warmth, and provide the added quality and practicality that makes it such a stellar hotel to stay at, even for a short while. Non-smoking and business floors are available, and of course the all essential broadband Internet special privileges and business-friendly services that anticipate the needs of business travellers. Other features that will complement your stay include the Business Centre with private workstations and boardrooms, along with a Fitness Centre and Spa for those who wish to unwind and relax. For all you foodies out there GMKL has four vibrant dining and entertainment outlets that provide cutting edge dining in Kuala Lumpur. The Mill, an all-day family-dining restaurant, serves Asian and Mediterranean cuisines with open kitchens. Bistro 160 is a cosy café and lobby lounge with direct access from the streets of Bukit Bintang, serving exquisite single-bean coffees, liqueur coffees, high-grade teas, gourmet salads and sandwiches, as well as premium spirits. The hotel’s Chinese restaurant and noodle bar, Lai Ching Yuen offers authentic Cantonese cuisine and home-style specialty dishes. Pulse, a rather happening party venue in Kuala Lumpur, features spectacular entertainment by top bands and celebrity DJs, has a cool dance floor, and a superb menu offering a selection of tapas as well as signature cocktails. 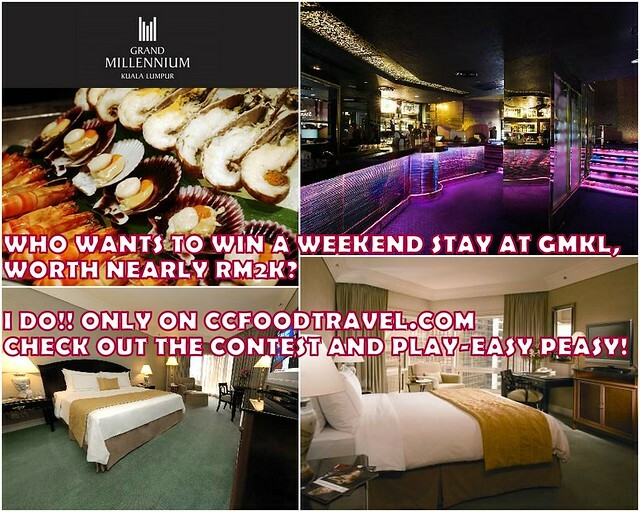 So when GMKL asked CCFoodTravel to hook up with them for this EXCLUSIVE TRAVEL CONTEST, of course we said yes! 4. The Winner will be announced on the 21st of May 2012 on the CC Food Travel Fanpage Wall and here on this blog. 6. This contest is open to EVERYONE. Next articleHappy Mother’s Day, Mom! Travel means relaxing in comfort, plush bedding, plush amenities, convenience and ease of travel. and life is a continuous journey beyond time and pace. It is the gateway to KL City! I want to stay at GMKL because i want relax and enjoy my moments with my honey !Cool ! [Z]zzzz in days or nights or anytime! out of 10, GMKL scores in my heart! You’ve got to write it on the CCFOODTRAVEL WALL dear!LOL It’s good! !